The mission of Antioch Ministries, Inc. (AMI) is to empower individuals and families to become more self-sufficient by developing quality, affordable residential housing; by creating home-ownership opportunities for low to moderate income individuals and families; and by enhancing the economic prosperity of Augusta's Urban Core. Our goal is to provide programs and supportive services that will raise the self-esteem of its clients and improve their self-worth by equipping them with marketable training skills that meet their needs. The Vision of Antioch Ministries, Inc. (AMI) is to be "The Leading Mobilizing Force for Affordable Housing in the Historic Laney Walker District of Augusta-Richmond County. To fulfill this, AMI has established and strengthened partnerships with area stakeholders and has leveraged all resources to address the critical housing needs of the community. Every new home holds the opportunity to secure a family's future and to spark a community's turnaround. Thriving communities provide access to secure jobs, safe streets, quality child-care and education. AMI believes that without this basic platform of opportunity, no individual can truly exercise his or her constitutional rights of life, liberty and the pursuit of happiness. 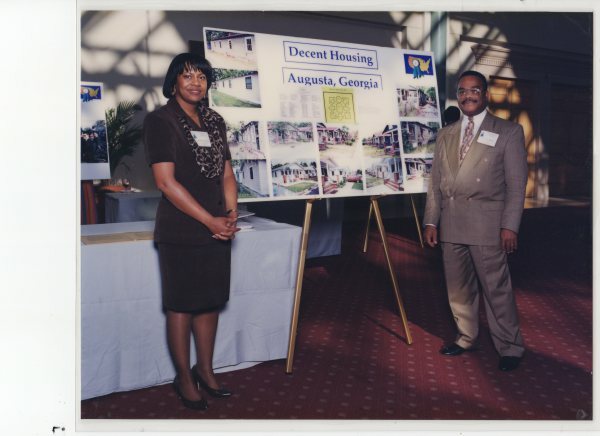 The John L. Gunther Blue Ribbon Award was bestowed upon Antioch Ministries Inc. (AMI) in 1997 by the U. S. Department of Housing and Urban Development for Excellence in Community Development. Antioch Ministries, Inc., a 501(c)(3) nonprofit organization, was founded in the year 1992. Rev. Dr. Kenneth B. Martin (pictured above) is the Visionary behind the success of Antioch Ministries in the redevelopment of Augusta's Inner City Neighborhoods. As a local leader in the housing and community development movement, Dr. Martin has been a catalyst, sparking initiatives that now empower an entire network of community-based organizations to rebuild Inner City Augusta.